The Library Media Center (LMC) collection contains approximately 22,000 items, including books, periodicals, maps, archival materials, posters, CDs, DVDs, and videotapes, housed in a beautiful two-level gallery setting. Along with books, a dozen online databases, access to the Internet, and other reference resources are available. Equipment that circulates includes TV/VCR/DVD units, LCD projectors, document cameras, digital cameras, e-Readers, mobile digital devices, camcorders, and light or sound systems. There are seven areas of the LMC that are available for general use. Section A, which seats 25, has three computers, and a short-throw, dual-touch interactive whiteboard for teacher and student use. Section B seats 20 and has a whiteboard, a large-screen TV attached to a DVD player, a casual reading rug, and carrels for individual work or video-viewing. Section B also has two computers for student use. The magazine area and the sofas next to overstuffed chairs in the fiction section give students comfortable places to work, read, or socialize. The conference room is used for meetings, telephone conferencing, and small group study sessions or presentations. The AV studio upstairs, and the AV annex in the technical processing area downstairs, allow students to work on video and audio productions. The project area has book binding equipment and materials for poster production. The LMC computer lab contains 25 hp computers. 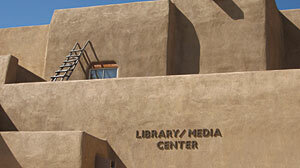 It is the only Santa Fe Indian School computer lab that is regularly available for student discretionary use before school, during lunch, after school, and during study hall.